I was lucky because I was only a few minutes from home and could lie down with a cool drink for an hour or two. It’s not always so easy for many people at the highest risk of heat-related illnesses, such as farm workers and outdoor laborers and factory workers. Or others who don’t know they’re at risk: people older than 65, who are overweight, who have hypertension or who take medications. Making sure people know about risks is a big step to helping them avoid something potentially deadly like heat stroke. To make your health education job easier, I’ve looked through piles of resources about heat stress, and here are my favorites. They're free, too. Heat Related Illness Poster, downloadable as a PDF. NIOSH Fast Facts: Protecting Yourself from Heat Stress, a free card available you can print or order with more detail than the previous. Adjusting to Work in the Heat: Why Acclimatization Matters, a detailed blog post that explains what happens when working in the heat. Look at the comments section for several resources in Spanish. Educational Resources, such as posters, factsheets and downloadable guides for employers and community members. Training for employers in English and a host of other languages. An Online Toolkit that covers pre-written communication pieces you can use at your organization. AFOP (the Association of Farmworker Opportunity Programs) regularly puts together resources and trainings to support farm workers. Their video on heat stress is simple, clear and a handy resource to keep bookmarked to share with clients. 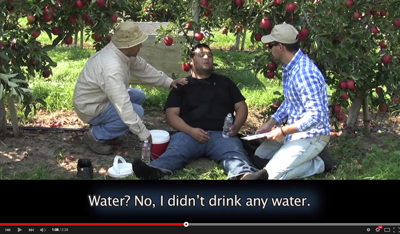 The heat stress video is also available in Spanish. What the thermometer is only one part of the temperature. The Heat Index Calculator from the National Weather Service shows how it actually feels. The Index facts in humidity to determine a more comprehensive temperature. For example, The air temperature may be 96°F, but if the relative humidity is 65%, the heat index (how hot it feels) is 121°F. Big difference. This calculator lets you add a temperature and humidity to show the Index. The Heat Index chart lets you interpret the results.